A short post this week, but with a recipe that warmly invites Autumn into the kitchen. If you have an apple tree go out and gather any windfalls; give them a scrub and a chop. You are now one step closer to a house saturated with the comfort-blanket aroma of Autumn spices: like a Glade candle, but nicer – and more edible. The little quote is how I feel about my two cats, Max and Mimi. Sadly, Max is very unwell and is unlikely to be with us for much longer. This week has seen us all focused on caring for Max in the best way we know how – the medical and nutritional care, but more importantly the increasingly gentle strokes and cuddles from a family besotted. As corny as it sounds, I feel time slow and become more precious when he is curled up against my arm, his little head resting contentedly and companionably on my shoulder. I think – I hope – Max feels our devotion to him. For years Max has been the unofficial king of our cul-de-sac, patrolling his radius of influence with majesty and extreme fluffiness. His assuredness – and possibly kinship with us – extended to following us, dog-like, to the post box a couple of blocks away. People would drive past and do an amused double take at the sight of black and white, long-haired Max running to keep up with us, his coat ruffling and swishing with every step. Now his kingdom is confined to our drive and back step, but still he stands and observes, with the same seriousness of purpose. He has definitely been the visible soul of our house. So this recipe is really about me and my family wanting a bit of comfort; you can’t remain too sad when you smell this cake baking. You don’t of course need such motivation to make this slightly sweet and decadently moist cake. It’s a perfect Autumn recipe, whatever your mood. And, as ever, it is a little bit good for you too. Don’t be shocked by the amount of apples in this recipe, they are essential to keeping the bars moist, as well as adding flavour and nutrients. Use any apples you like but do keep the skin on. Although the ingredients look a bit worthy these bars really do taste very nice, and are popular with children; they love the warm spices. If you don’t have all of the specified spices just use the ones you do have and maybe increase them a little. You could make this recipe as soft biscuits, but I prefer the ease of pressing the mixture into a pan rather than fiddling with shaping individual mounds of dough. If you do make these as biscuits grate the apple and only bake for between 9 and 12 minutes. As biscuits they don’t really spread much so you might want to flatten them a bit with the back of a wet fork. Fully line a 18 x 23 cm baking tin with baking parchment. I tend to use two crossed pieces, or to use one large piece and notch where it will fit into the tin’s corners, so that it overlaps. Mix together the sugar and butter, or oil, and beat until a bit fluffy. Beat in the eggs and vanilla. 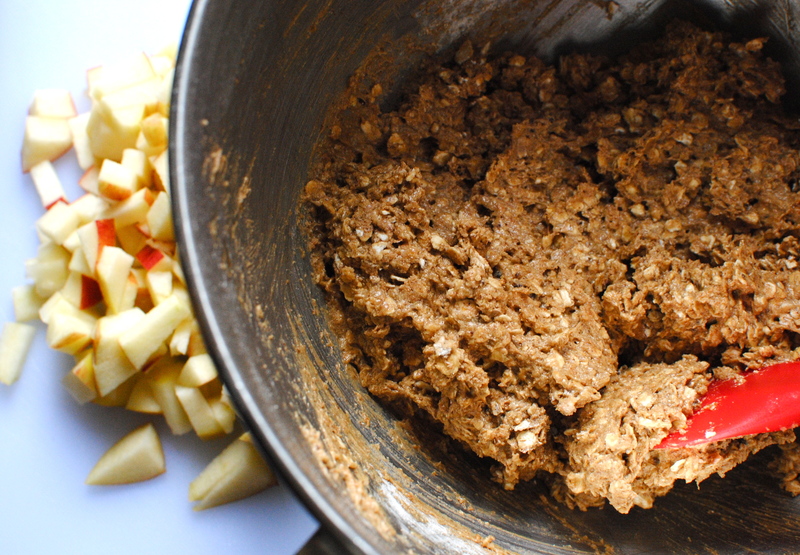 Stir in the remaining ingredients, folding in the apples at the end. Press this fragrant mixture into the prepared tin with wet fingers and top with the chopped nuts or sesame seeds, pressing these lightly into the mixture. Bake the cake at 180C for 25-28 minutes, or until it is just starting to pull away from the sides of the tin. Allow to cool completely before cutting into bars. The bars will keep for up to four days in an airtight tin, and they freeze well. Aw, thanks JK. He’s asleep just now but I will whisper what you said in his ear. Taking it all day by day. Thanks for getting in touch. Definitely one to bookmark. Cake that’s good for you is always welcome. Hugs for Max. Thank you Janice – for the bookmarking and the hug for Max. Much appreciated. Oh Kellie, I’m really sorry to hear how unwell Max is. I’m certain he’ll know how much you all love him. A question about this recipe, is there any alternative to the sugar or is it intrinsic? Thanks, Rosie. He is sleeping peacefully having had a short foray out through the catflap. He’s a wonderful feline friend who has always enjoyed human company. I think he thinks he’s human, or that we are cats. As for the sugar in the recipe, intrinsic. It is minimal however. You need some sugar otherwise you alter/lose moisture, texture and browning. In biscuits and cookies you also lose the necessary ‘spread’. From what I understand in standard recipes you can ditch 1/3 of sugar, but over that amount the result is compromised. I typically do that already in my recipes so you wouldn’t want to go further. Hope that helps. Lovely photo of Max what a handsome gent! I am sorry to hear he is ill, our animal friends have a special place in our hearts and homes. We also have a cat named Max! He was a rescue, and arrived with his name. Our apples are in season now and I look forward to trying your cake recipe. Lots of apples look luscious to me! You are right – he is a handsome gent. Our Max (and Mimi) is a rescue too, although unkindly he came with the name Bandit (for his markings, but I thought it was a bit criminal-sounding). A house isn’t a home until it has at least one furry creature in residence. And, I hope you try this easy, accidentally good-for-you recipe with California apples. Thank you for your kind comment, Deb. Lovely post and beautiful recipe. Definitely on my list of Good Things to bake! Thank you Lizzy. It’s an easy recipe that is perfect for any apples you may have. The rest of it is pretty much store-cupboard stuff. Hope you are having a lovely spring, btw. We have gone straight from a wonderful late burst of summer (our highest ‘summer’ temps were this past week!) to autumnal deluge in 24 hours. Och well, as we say around here. 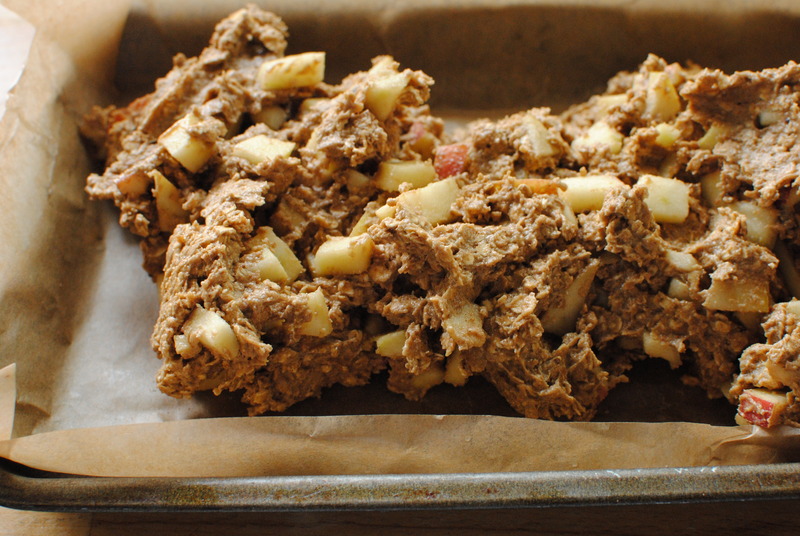 Your apple bars look delish and something I’ll definitely be making with my 4 yr old. I’m so sorry to hear about your cat but enjoyed learning about his personality through this post. I had an orange tabby for 20 yrs who also followed us around like a dog + thought he was human. What amazing animals they are. Peace and comfort to Max and your family. 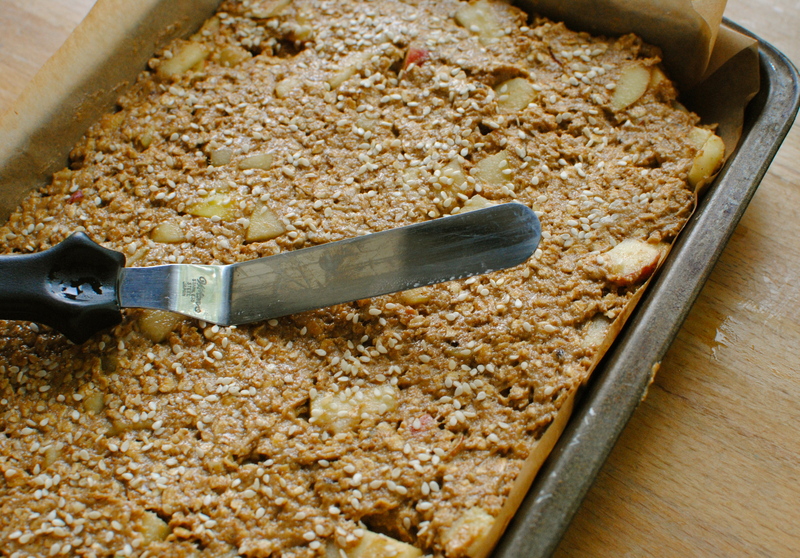 I hope your little one enjoys the apple and oat bars. I remember the messy days of baking with my daughter when she was wee. Always worth the extra effort though 😀 Thank you also for taking the time to read about my Max. He is a special cat, as hopefully all cats are to their human servants and betters. Glad to hear that he lived so long and that he had the amusing ‘dog’ trait. I bet you still miss him. 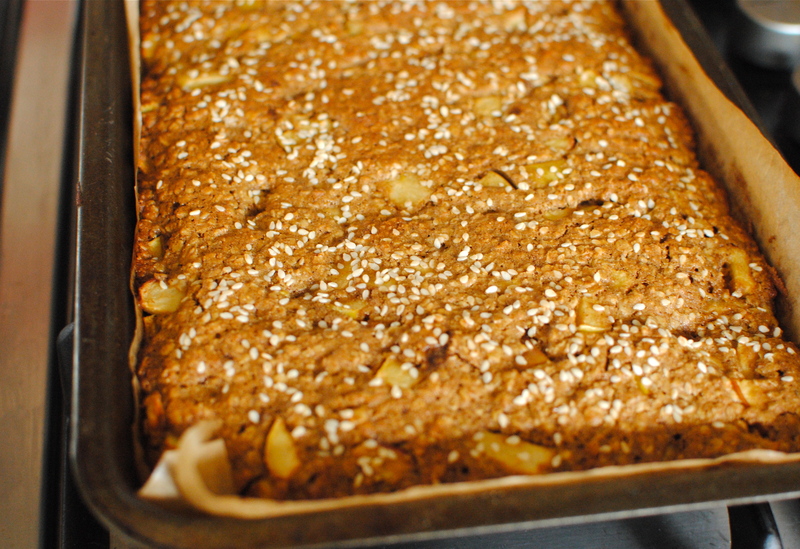 On a happier note, the oat and apple bars look wonderful ~ I would love them as I like anything oaty and appley! Take heart that Max might perk up, you never know, my parents cat did……..here’s hoping and praying. Hello Karen. Yeah, that’s my big guy. Thanks so much for getting back to me. He is on antibiotics for the liver/bile duct infection but the main problem that may hinder him healing is the massive amount of weight he has already lost. Because he’s so fluffy – and we have another cat – we didn’t see that he wasn’t eating until it became more obvious. Have been doing the minced chicken, M&S poached salmon, ham and minced prawns thing but very little appetite. But he is still affectionate, responsive and pain-free, and we know he still has quality of life so we will not give up on him. Thank you Karen for your kindness. And if your folks find the elusive bottle, I would love to know what they gave Gizmo. Cheers, lovely. Thank you Junia. I saw the event on the Spicy RD and as I had just posted an apple recipe the previous day I thought it was meant to be. Your quinoa-apple muffins look pretty special. I’ve sent the link to a g-f friend. Thank you Richa. I’m happy to have found applelove on The Spicy Rd’s blog because I have discovered so many wonderful blogs, and kind people. Thank you for stopping by. Max is asleep beside the fire, quite content looking. Your apple bars look great too 😉 A great source of energy! Hi Valerie. You have a lovely blog! All of us applelovers have had a good excuse to connect and it’s been a great way to find new like-minded folk. Max is well gorgeous and still a bit cheeky. He makes a beautiful screensaver, too! Well, partly out of homage to Max (the coolest cat ever – your photo does not do justice to his scale – a bear of a cat) I have made this recipe and, like every recipe of yours, it is so full of flavour and utterly delicious – highly recommended. It always feels like a treat when I make one of your recipes as I don’t even need to think what to make and I know it’s going to be good…you spoil us. Extra cuddles for Max please! you are next through our way. 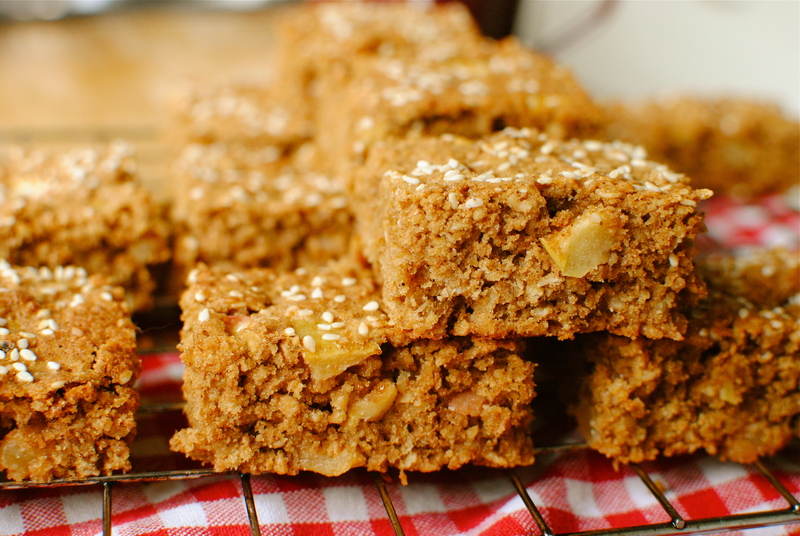 Apple Oat Bars sound lovely! I’m surely going to try these soon. Thanks! They have a boring title (I should really make snappier titles) but they are really very nice. Thanks for commenting. Have a lovely day. 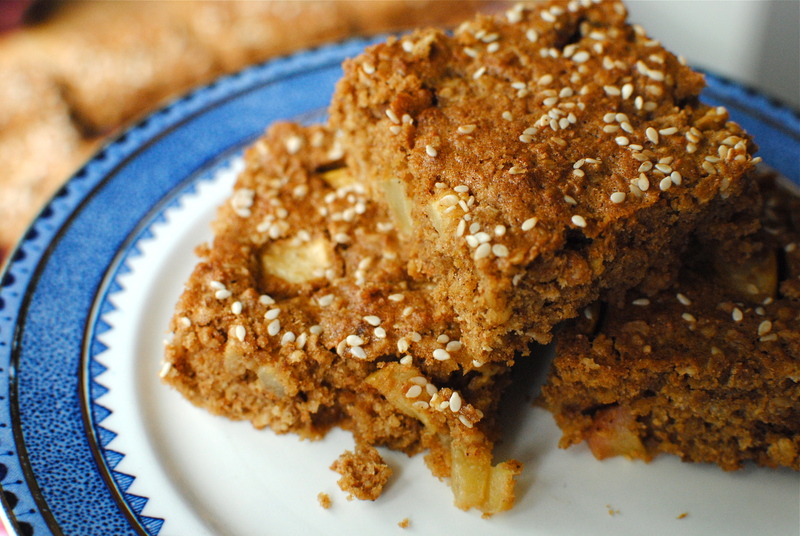 What a delightful dish and such great photos of the Apple bars! Glad to bake along with you on this BlogHop! Thank you Elizabeth. I accidentally found out about #applelove and bloghop and so glad I did! The aroma in the house when I baked them was wonderful – a cross between a Moroccan spice market & Christmas! Thanks for stopping by. 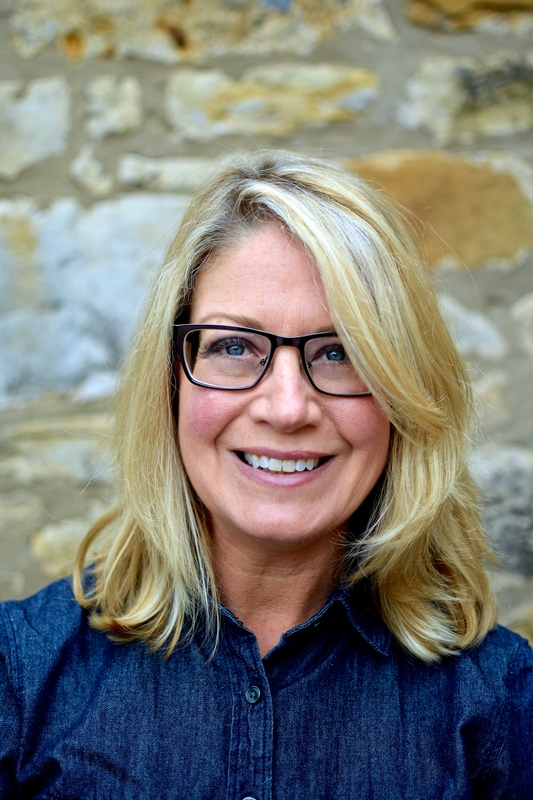 Kellie – so sorry to hear about Max. – but please take heart in the fact that he’ll be enjoying the lovely scent of your baking. 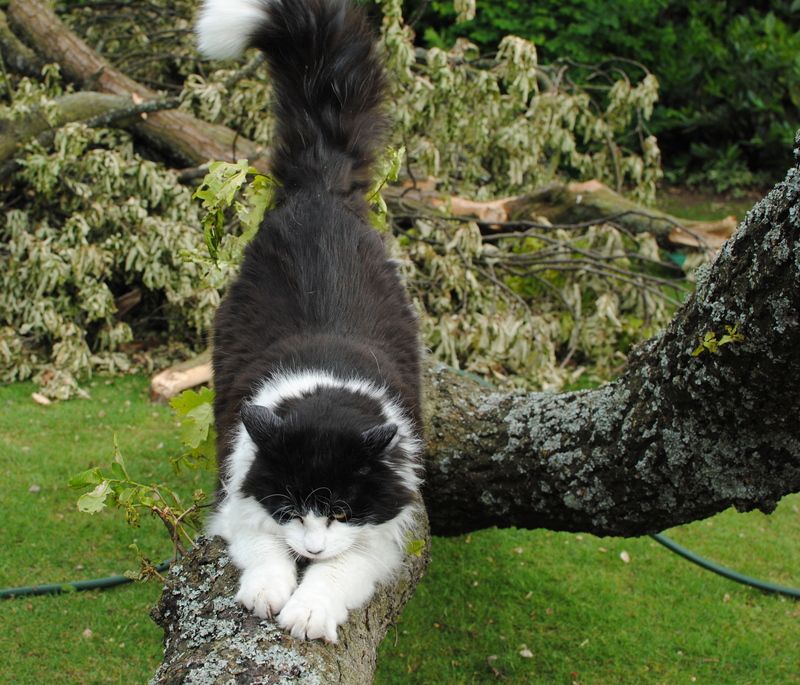 Misty, our cat who had been with us for 16 years, used to jump up on the roof of our car as we were trying to park – or circle round the car as we were trying to reverse into a parking space not to mention trying to avoid her. Hello Angela. Your cat Misty sounds like she was quite a little character too. How funny that she wasn’t frightened by the engine noise! I am pleased to report after being very close to not being here, he is making a remarkable recovery. Still clinically unwell but he doesn’t know that, so he’s still being a bit spoiled by us. Thank goodness. I hope you have now have another cat to keep you on your toes! Thanks so much for commenting and telling me about Misty. A lot of animal lovers among you all. OMG! Max could be Houdi’s twin! The only difference is that Houdi doesn’t have white on his back, but the face – I thought I was looking at my own cat! Such a cutie! 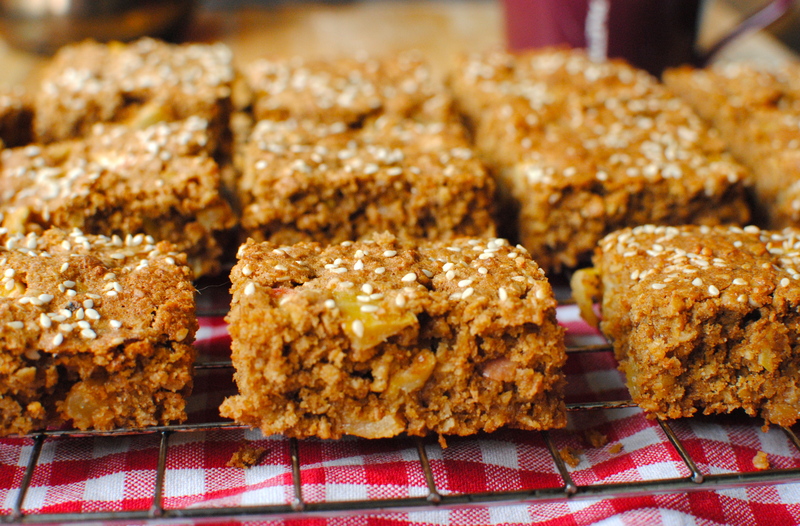 Love the Apple and Oat Bars! They look quite tasty and very healthy! Thank you MJ, about Max/Houdi(!) 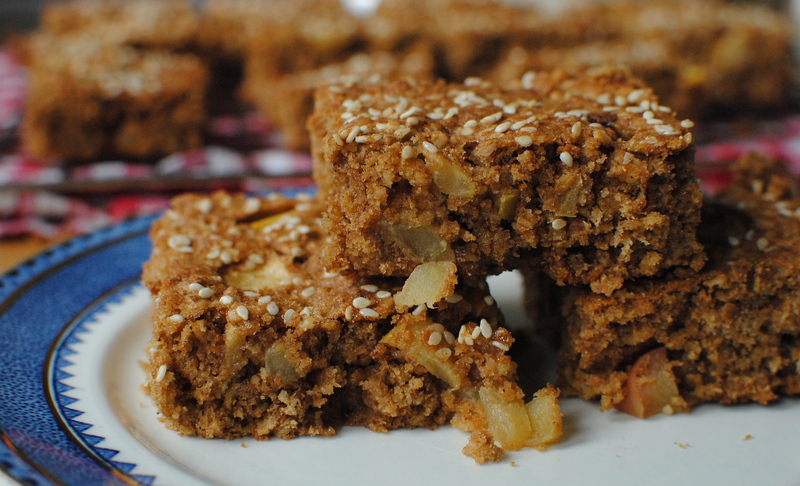 and the apple and oat bars.